This is part 2/2 in my series on the menstrual cup. Part 1, 9 Reasons Why I Chose a Menstrual Cup, can be found here. Now. What I really wanted to talk about was how to clean and care for your menstrual cup — hence the title of this blog post! While you are menstruating, you need a quicker clean between dumping your cup out and reinserting it. Divacup.com advertises a Diva Wash, but to be honest, I haven’t felt the need for that. I use a non-fragrant soap (Ivory bar soap) and warm water to wash out my Diva Cup. In between cycles, I boil my cup in a small pot that I use ONLY for this purpose! (In fact, it stays in the bathroom when not in use.) Boil for at least 10 minutes… make sure not to boil all the water away or the cup will burn. If at any time there is blood in the little holes around the rim of the cup, you have to clean that out, because it is the little holes that create the suction and hold it in place. To do this: Fill the cup with water, hold in one hand, cover the large opening with other hand, turn upside down, and push down on opening. The pressure pushes water through the holes and cleans them out. Just be careful where the water squirts (I hold it down in the sink.) Do not use toothpicks or any other way to clean the holes, as those can damage the cup. Lastly, storage of your menstrual cup. The Diva Cup comes with a cotton bag. Be sure not to store your cup in a plastic bag. It’s important because the cotton is breathable. 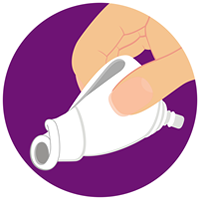 Have you made the switch to a menstrual cup yet? Let me know! The opinions stated in this blog post are mine alone. Facts and photo were obtained from http://www.divacup.com. This entry was posted in Natural, Product Review and tagged cheap, Diva Cup, DivaCup, environmentally friendly, female, green, inexpensive, menstrual cup, menstruation, natural, period, puberty, woman, women. Bookmark the permalink.